An unstable climate birthed by a tidally-locked planet could create a runaway greenhouse effect that could result in an atmosphere like Venus's. Strange, newly discovered structures in Venus' atmosphere are redrawing scientists' perceptions of the planet's magnetic environment. The European Space Agency's Venus Express spacecraft spotted these enormous magnetic entities — called flux ropes — stretching for hundreds of miles in the planet's upper atmosphere, above the poles. Flux ropes have been seen before around other planets, including Earth. They transport superheated plasma gas from one side of the "rope" to the other. But on Venus, scientists don't know why these phenomena form in the atmosphere, according to a paper published Dec. 26 in the journal Geophysical Research Letters. How long they exist, and how they dissipate, are also mysteries. Magnetic flux ropes come together from twisted magnetic field lines. They have been spotted in magnetic fields all over the solar system. On Earth, flux ropes form near the face of the planet opposite the sun. The stream of charged particles known as the solar wind flows around the planet and creates a "magnetotail" of charged particleson the other side. Periodic solar outbursts known as coronal mass ejections arise from a type of flux rope. The delicate structures sit on top of the sun and transport matter and superheated gas from one part of the sun to another. Researchers believe that when the flux ropes become unstable, that's when the sun erupts. 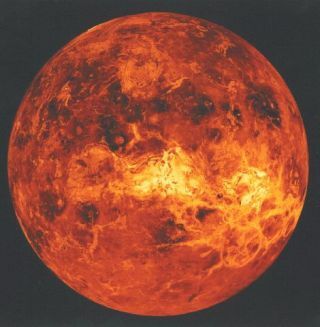 Venus stands apart from most other planets in the solar system, however, because it has no magnetic field. Zhang said the ionosphere (or upper atmosphere) of Venus acts as an obstacle to the solar wind. When Venus' atmosphere has a higher pressure than the incoming solar wind field, the ionosphere is considered "unmagnetized," meaning that it's free of all but the smallest magnetic field structures. "The ionosphere is filled with these very small — kilometers across — flux ropes," Christopher Russell told SPACE.com. Russell is a space physicist at UCLA and a co-investigator on Zhang's study. "That might seem large to somebody walking down the street, but in terms of the size of the ionosphere, they are small," said Russell, who was also the principal investigator of NASA's Venus Pioneer missionthat first spotted these structures. Scientists have known about these small flux ropes for a generation, since Pioneer orbited Venus in the late 1970s and early 1980s. But the giant flux ropes were completely unknown until Venus Express — which was in a different orbit than Pioneer — spotted them with its magnetometer in 2008 and 2009. And they likely are created by a very different process, Russell said. Venus Express saw the giant flux ropes in magnetized regions of the Venusian ionosphere over the poles, where that region of the atmosphere of Venus made its closest approaches to the planet. According to the paper, these ropes happen "quite often" and are hundreds of miles long, about as long as the depth of the ionosphere. Scientists determined that the flux ropes form from solar particles on the side of the planet facing away from the sun, in the magnetotail. As the ropes' magnetic fields twisted tighter, they passed from the equator region to the poles. "It seems to be associated with a process known as reconnection, which is magnetic field lines joining up together and forming a new magnetic configuration," Russell said. On Earth, this is the driving force behind the planet's spectacular auroras, which also tend to originate in the magnetotail. As Venus' flux ropes move over the poles, the local magnetic field they create is stronger than the background, Russell added. To better understand them, the scientists are now working on a statistical survey to figure out how often flux ropes occur in Venus' ionosphere, and where they are. Zhang, who is the principal investigator for Venus Express' magnetometer instrument, noted that giant flux ropes were previously found in the atmosphere of Mars — but only in the southern hemisphere. Mars, like Venus, does not have a planet-wide magnetic field. "The observation and formation of the large flux rope at Mars might raise speculative questions related to the giant flux ropes at Venus," Zhang said, but added it was too early to draw direct links. At least one study, according to Zhang's paper, has drawn a link between the magnetic rocks found on Mars and the flux ropes found above the Red Planet. But Mars is a much different environment than Venus, so the giant flux ropes found by Venus Express could arise for another reason, he said. Zhang works for both the University of Science and Technology of China and the Austrian Academy of Sciences, while the rest of his paper's research team hails from Austria, the United States, Germany, China and the United Kingdom.